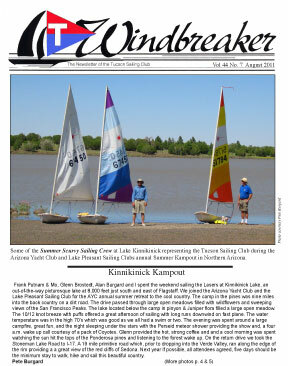 For more about 2011 Kinnikinick check out this story from the Tucson Sailing Club. They and Lake Pleasant Sailing Club joined this year’s AYC annual campout in the woods, the Kinnikinick weekend, and Peter Burgard snapped some pictures and wrote some words and published them in the club’s newsletter. Click HERE for the TSC Aug 2011 Windbreaker newsletter. The 2011 “Escape to Pine Mountain” was a huge event for my family. It was our first scheduled opportunity to escape the heat, the traffic, and the playstation in the valley of the SUN. Not that the event as a whole was so huge, but getting my kids away from the TV was virtually miraculous. Many obstacles had to be overcome. Things like sudden onset of a ailment requiring proximity to a bathroom, to queasy carsick feelings of the back row passengers in a SUV crammed with six people, camping gear, chairs, outdoor games, and a midsized dog. All of it resolved with patience, no schedule, and the first potty stop at 6500 feet and 80 degree sunshine. We arrived as scheduled – Saturday sometime. There where already some adventurous and practiced campers setup in the area with sailing burghy and race mark signalling their territory and that we where in the right place. Paper plates guiding the way to the fresh and clean porta-potties spaced out around some shady and pine needle covered tent spots. We picked up a mooring… i mean, a camp spot upwind of the potty, and the kids took off into the woods like oil dripped on water. No video games, music players, or fighting over computer time… it was just about heaven. After unloading the gear and making lunch – amazing how the kids will wander back just as you are finishing food prep – we were joined by helpful (and hungry) kids from the already established camps. Tents setup, camp gear stowed, we set off to mingle with the others already playing horse shoes and relaxing in the cool shade around the fire pit. Members of Lake Pleasant Sailing Club, Arizona Yacht Club, and Tucson Sailing club were all strewn about the gentle slope in all sizes of tents, camp trailers, and vans. Ahhh, such a heart warming – cool weather – sight! A few hearty sailors who took a stack of Lasers to the lake for some afternoon sailing while most others took a nice nap. The winds must have been perfect, since one of the sailors related that he had never gone so fast in a laser before. It’s amazing what a “Fresh” breeze and no hills to funnel the wind can do for you. Later in the afternoon, while relaxing and getting to know some of our TSC and LPSC brethren, our attention was drawn to the table where piles of shish kebabs, pots of corn, and plates of veggies and sides where being dropped from campers all around. Dinner was imminent. And from the looks of things, it was going to be an amazing feast. Off to camp, we brought out offering, including another table to pile the overflowing food (and adult beverages). And it was an amazing feast. Of course, my kids only ate the hot dogs and way too many sm’ores cooked over the sensible and warming campfire, but that is OK, more kabobs for me. All – in – all, about 60 people made up the campout this year. Perhaps it was a light turnout for the annual event. But it was fun, and we got to meet some very friendly people who were there to have a good time in the peace and quiet – and coolness – of the not so distant forest. I have always had to move mountains to make it to the mountains, but once I get there, the people, the peace, and the separation of all things buzzing and chirping always make it worth the effort.